Even though the work of the ESRC Genomics Forum officially ended at the start of June this year, its legacy lives on. 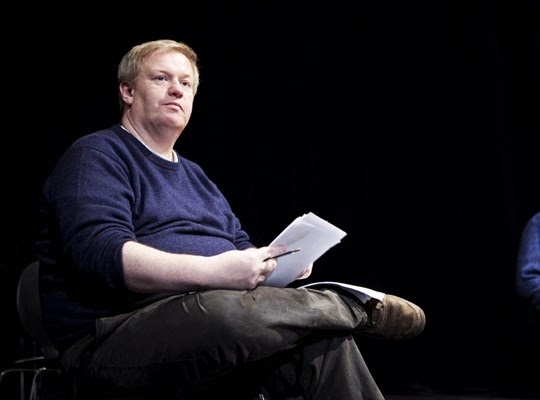 Peter Arnott was Playwright-in –Residence with Forum from 2011 until 2012. As a direct result of this residency, Peter has now completed a genomics-inspired play which will receive a rehearsed reading at Edinburgh’s Traverse Theatre, later this week. “If we're not created, we are accidents, and need to find a new reason to care. “So I'm looking at a family whose life is, well, perfect. They're comfortable, civilised, well intentioned (or pretty much). The drama comes from biology...the unnegotiatable facts of life and death. The final session of the 2013 EGN conference was appropriately dedicated to examining how engagement between the social and life sciences would continue beyond the Genomics Network. In his introduction, the session chair – Graeme Nicol, Former ESRC Research Committee Member and Impact Champion – indicated how appropriate it had been that the conference had focused on the “return on ESRC’s investment” the Network had achieved during the last decade, demonstrating exactly how substantial this had been. With that investment now nearing its end, the closing session of the conference would allow the Directors of the four Network Centres to not only to look back on their work, but to also to highlight the future plans and trajectories for these. The Genomics Forum was first to contribute, with former Deputy Director, Dr Steve Sturdy, speaking in place of Forum Director, Professor Steve Yearley, who unfortunately was unable to attend the conference due to illness. Steve commended the ESRC for, 10 years ago, having the vision to identify the important transformations that developments in the life sciences were beginning to have upon society. The ESRC responded accordingly by funding the three research Centres and the Genomics Forum to investigate and engage with these societal impacts, under the umbrella of the Genomics Network. Elaborating on the work of the Genomics Forum, Dr Sturdy indicated that the ESRC was visionary in establishing this not to undertake research, but to provide an interface between the issues being researched by the other three Centres and key stakeholder audiences, including scientists, policymakers and the public. Steve concluded by indicating that even though there would no longer be a role for the Genomics Forum beyond the end of the Genomics Network, an element of “Forum-ness” has been inculcated into the remaining Centres and more widely, and this would act as a fitting legacy to the Forum’s work and impact. Professor David Castle spoke about the future direction of Innogen. He indicated that the partnership between the University of Edinburgh and the Open University would endure, and this had been cemented by the establishment of a memorandum of understanding. The Centre was undertaking a process of rebranding; reflect its ongoing movement away from its original focus on “genomics” to a more general interest in socioeconomic influences resulting from the life sciences and technical innovation. David further indicated that the repositioning of Innogen to become the Innogen Institute would be phased, with the new Centre increasing its activity on the run up to the final cessation EGN-related research in March 2014. The work of the new Innogen Institute would build upon that of the old Centre, which had recognised publications in almost all areas of “the Web of Science”, and the Institute’s work would be supported by an ever increasing number of UK and international funders. Professor Castle also noted that as well as undertaking research, the new Institute would focus upon providing tailor-made training, such as the new MSc in Management of Bio-economy Innovation and Governance. Setting out the future direction of Cesagen, Professor Ruth Chadwick indicated that the formal collaboration between the Universities of Lancaster and Cardiff would cease in June 2013. However, a number of pre-existing links and collaborations will continue, resulting in tangible outputs such as the journal New Genetics and Society. Cesagen will continue as a Cardiff-based centre for social science research, but it would transform itself to become the Centre for Ethical and Social Aspects of Genomics and Epigenetics (CESAGENE). Ruth stated that research activity would be located at the Cardiff School of Social Sciences, but would also feature internal collaborations with other schools at Cardiff University. Cesagene’s research would focus on key themes that include: personalised medicine; epigenetics; ageing; and food. Egenis Director, Professor John Dupré, started by identifying that his Centre had a different background to the others within the Network, resulting in some distinctive features in the work Egenis undertakes. Specifically, Egenis has brought together the fields of sociology, STS, the philosophy of science, and (increasingly) anthropology, which do not necessarily naturally complement each other. Its work has been wide-ranging during the last decade, covering subjects as diverse as polygenic disease, the “philosophy” of stem cells, and “big data”. John set out that his Centre will also continue beyond the end of the Network, with Egenis being the title that represents the Exeter Centre for the Study of the Life Sciences. The Centre would continue to focus on research into areas such as: genetics and identity; health technology and its impact on society (and in particular, the role of diagnosis); autism, dyslexia and ADHD; and the role of data within research. Professor Dupré will continue as Director of Egenis. In addition to this role, he will lead a project relating to the ontology of contemporary biology. With the Centre Directors having set out their visions of the future for their respective institutions, the ESRC Chief Executive – Professor Paul Boyle – concluded the conference. He stated that the ESRC had made a very wise choice when it agreed to fund the Genomics Network a decade ago. The Network exemplifies the historic and future requirement for research into the societal impact of developments in the life sciences, and it will still be a number of years until it is known exactly how successful the ESRC’s investment has been. In many ways, “This is not the end…” Professor Boyle stated. 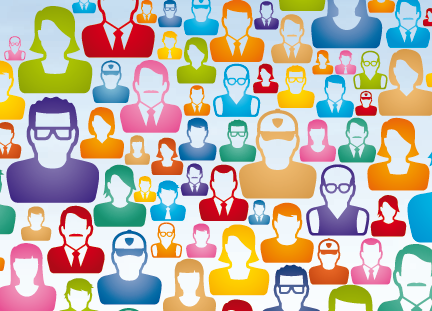 Although the ESRC may not now fund the Network directly, it will remain very supportive of the sort of social science research Network Centres have, and will continue, to undertake. 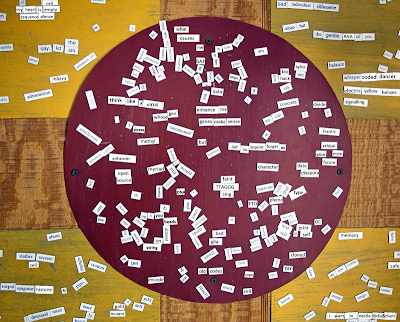 TTAGGG is an open source poetry sequence generated through contributions from EGN 13 delegates. 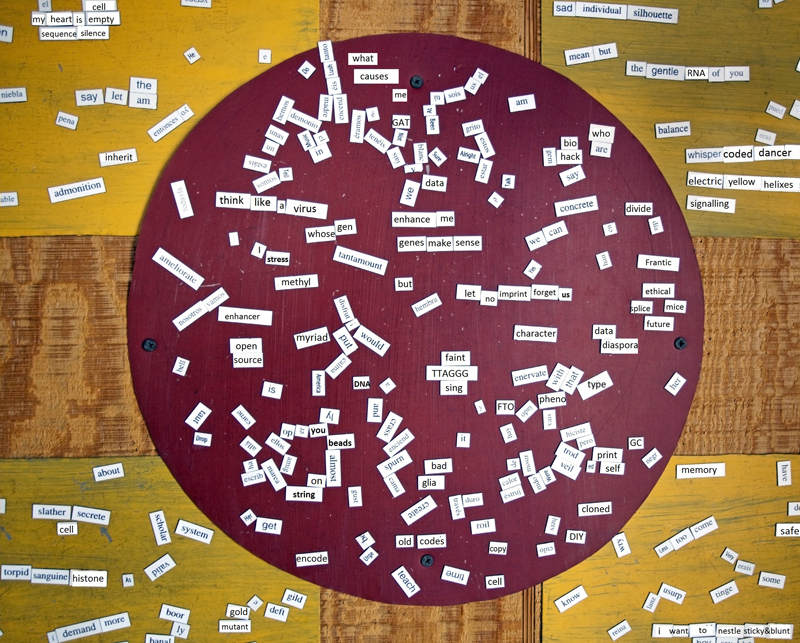 Contributions may be segments of verse borrowed (or hacked) from existing poems or prose, or they may be individual words or fragments of ‘found’ text snipped from the conference programme or heard in presentations and discussions. You might write your own poetic responses to ideas generated throughout the conference, or to the poem itself as it is built and modified online. An experiment in artificial evolution in the creative commons, the TTAGGG sequence will store complex information, respond to its environment and be a thing of strange beauty, open to modification, enhancement, repetition and mutation. 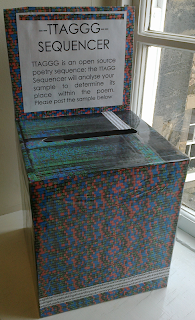 While the poetry I had been writing ‘in residence’ at the Forum was mostly concerned with epigenetics, I saw the TTAGGG sequence as a way of testing the notion of the poem as a mode of recording personal emotion expression. This was in part an attempt to move away from the kind of anecdotal lyricism that is often the obvious poetic response to ‘difficult’ issues in medicine and science: it seemed there were far more interesting and relevant ways of considering how developments in the life sciences could be discussed in poetry than imagining how they might make a single poetic speaker feel. I’ve been interested in the representation of medicine in literature for some time, and I wanted to produce something quite different from the kind of first-person poetry that frequently comes out of such interchanges – a frustrated and often powerless voice, an ‘I’ trying to understand how developments may affect my understanding of my body, myself. It wasn’t that I found such personal insight insignificant, rather it seemed that to do justice to the unique interface between the life sciences and social sciences achieved throughout the run of the Genomics Network, an approach which incorporated a range of perspectives and modes of address needed to be attempted. By eliciting contributions from delegates, and by trying to depersonalise my own contributions to the sequence by using found text, snippets of conversations and presentations, I hoped to sidestep the responsibility of providing a subjective account of such a diverse programme and try to achieve the kind of plurality, performative objectivity and variation of thought and insight that these complex issues deserved. I don’t know if the TTAGGG Sequence achieved this, but part of its ‘experimental’ nature was the acceptance that failure might lead to a better understanding of how to frame the question, or what the problem might be. Of the definite successes of the project, I count highly the enthusiastic and intrigued responses I got from many conference delegates. It was refreshing for me to explain how my project tried to participate in the debates of the conference, and to find that though I was coming from a different epistemological position, there was some common ground, and much openness for engagement. The actual poetic contributions I got were delightfully various. Some followed tradition verse structures (the clipped form of the Haiku appealed to many) while others concentrated on the rhetoric of social science and policy communication – the repetitions, freewheeling metaphors, strangeness and contradictions of the language employed in this supposedly objective discipline. In my own contributions, I was surprised by how quickly I fell into an imperative register and how the demands of writing on the spot led me to use the present tense, often utterly eschewing pronouns and prepositions. While anonymity was guaranteed for delegates who wrote their contributions on cards and posted them in the ‘TTAGGG Sequencer’ (my gratitude to Steph Wright for helping me build this complex machine! ), additions from private Twitter accounts constituted more of a public statement, and I’m grateful to those who spoke out in this way. I don’t think anyone used my password and took up the offer to sign in to the TTAGGG Twitter account and tweet impersonally from there, which gives an interesting insight into possible concerns about invasions of privacy and the dangers of open access in a field where large data sets and their possible uses is a major point of ethical and legal discussion. The TTAGGG Sequence will remain on Twitter and can be found at #egn13poetry. However, I am currently working on a number of different ways to manipulate the sequence. In a nod to a purely scientific approach, I am ordering it in simple chronological order (fig. A). In honour of traditional poetic formal constraints, I’m using a programme that organises individual lines into rhyming couplets (and only removing auto-rhymed lines) (fig. B). Finally, I am asserting the troublesome aesthetic and subjective authority of the poet by organising the text into what seems (to me at least) a coherent poem (fig.C). I hope to perform some of it at Syndicate, a new media poetry series I co-host held at Inspace in Edinburgh, on 21st May. What the opportunity to act as Poet in Residence at the EGN Conference 2013 and the Genomics Forum through April gave me was the invaluable space to write and also to reflect on the possible modes of communication between poetry, science and social study. I’ve always been interested in the critical potential of poetry, so the insights I have gained ways of approaching and understanding public ethics, cultural differences and social impact within the social sciences have encouraged me to reflect on my own practice as a poet and researcher. I am incredibly grateful for the welcoming and generous response I received at the Forum. I hope the exciting interactions between art and life science studies fostered here will continue in many forms in the future. these bugs/ can eat their own waste! My sweetheart took his burnt toast & departed with his cellular automaton. What … what would NA12878 do? the TTAGGG Cloud: impossibly linear Wordle! Perfect distribution of emphasis cut with rigour & balance! Catherine Lyall (Genomics Forum), chairing, opened the session by remarking that “The research conducted by the EGB has had an impact way beyond academia.” We couldn’t, she said, demonstrate the full scope if its global reach in one short session – but the speakers had a jolly good go. Joyce Tait (Innogen), herself no slouch when it comes to speaking truth to power, or to policymakers, at any rate, introduced Michael Oborne, formerly of the OECD. In 2006, Innogen was contracted by the OECD to develop scenarios of healthcare in 2030, a project which, Professor Tait said, was “quite formative” for the centre. The scenario report, Health Biotechnology to 2030, considered the pathways that health biotechnologies could follow, the future trajectory of the bioeconomy primarily in the context of human health, and the likely societal, economic and policy impacts of these projected outcomes, positing two potential scenarios . Outlining some of the report’s key points, Dr Oborne said one scenario in particular underscored the necessity of changing regulatory systems to control conditions under which innovation can take place – regulators are the gatekeepers to innovation. Christine Knight (Forum) spoke about a joint project between the Forum and the Human Genetics Commission (HGC) in 2008, a ‘Citizens’ Enquiry into the forensic uses of DNA and the National DNA Database’. The report identified 10 topics of particular concern, which were subsequently used by the HGC as the basis of a public consultation. Sarah Cunningham-Burley, at the time a member of the HGC, made a video contribution (the film was made by the Forum’s very own filmmaker-in-residence, Cameron Duguid – isn’t it handy to have a filmmaker in the house? You never know when you might need one), praising’s the Forum’s expertise, particularly its efforts to engage groups generally regarded as ‘hard to reach’. Cesagen’s contribution was a reflection on the interface between academia and Parliament, focusing particularly on the benefits of policy placements. Sarah Bunn of the Parliamentary Office of Science and Technology (POST), gave an overview of the work of POST, mentioning particularly POST fellowships, which give postgraduate or early career researchers the opportunity to work with POST on a specific briefing or project. She also said the POST is to recruit two social scientists, which has to be seen as something of a surge of recognition for the field. Richard Watermeyer (Cesagen), talked about his own experience of a short POST placement, part of his impact and engagement research. “I can’t tell you what an eye-opener it has been,” he said, although he did a pretty good job of telling us. Richard is soon to take up a two-year secondment in the office of the Chief Scientist for Wales, the first time a social scientist has been offered such an opportunity. Keep this up, Richard, and when Wales realises it needs a Chief Social Scientist you’ll have to be in the frame. The upshot of this session, however, has to be: Round five to the EGN, and a victory on points. What’s not to like about responsible innovation? I mean, who would rather have irresponsible stagnation? 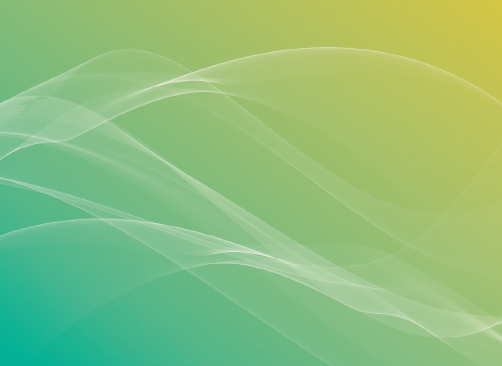 But even if we think the first of these sounds better, we might still ask where the term ‘responsible research and innovation’ (RRI) has come from, what it means, and where it is going. These were the framing questions for the first plenary session on Wednesday morning. In introducing the session, chair Hub Zwart (Nijmegen) raised two further critical questions to set the stage for the provocations and discussion the followed. First, he asked whether RRI reflects a paradigm shift away from more traditional ‘ethical, legal and social’ approaches to studying innovation. And second, he asked what the role of social scientists might be in the context of RRI – is it to help organize and mediate responsible research, or is there space for a more critical role? A key goal of responsible innovation that was highlighted throughout the session was the opening up to wide(r) deliberation some fundamental questions about the purpose and direction of innovation. Embracing this spirit of ‘opening up’, Richard Owen started the panel discussion by asking the audience what they understood by the term ‘responsible.’ He then drew our attention to two central ideas of ‘care’ and ‘responsiveness.’ Crucially, starting with these ideas helps us get away from a simple assessment of innovation in terms of risks and benefits, which has become a dominant and often unproductive evaluative framework for new technologies. But it doesn’t eliminate the broad challenge of how to pursue innovation under circumstances of uncertainty. René von Schomberg presented a definition of RRI as “a transparent, interactive process by which societal actors and innovators become mutually responsible to each other with a view to the (ethical) acceptability, sustainability and societal desirability of the innovation process and its (marketable) outcomes and impacts.” His remarks focused on the management of innovation, drawing our attention to stakeholder involvement and the distribution of labour and tasks in the innovation process that might stem from RRI. He proposed that RRI does mark a ‘paradigm shift’ in research and innovation policy, and noted that RRI is likely to be incorporated into the European Commission’s Horizon 2020 research framework. Hugh Whittall reflected on how the Nuffield Council on Bioethics has been thinking about issues like responsible innovation. Hugh proposed that RRI does seem go beyond the traditional ‘ethical, legal and social issues’ approach to studying new technologies, but suggested that it should be accompanied by a broader vision of ‘public ethics’. This is an idea that the Nuffield Council have been working with in a recent report on emerging biotechnologies. They see a focus on public ethics as a way of opening up and reframing discussions to help bring public values to light in technology choice and democratic decision-making. Using data gathered by the OECD, Iain Gillespie showed the clear links between innovation and growth in economies around the world. He suggested that both the public and private sectors have ‘an economic and moral responsibility to innovate,’ but that investing in the ‘right’ innovation is also part of this responsibility. He suggested that innovation and responsibility could become mutually empowering ideas, and sees responsible innovation as a potential ‘New Enlightenment,’ one that puts society back at the core of the innovation enterprise. Jane Calvert reflected on her experiences as a social scientist deeply involved with the synthetic biology research community. She noted several positive aspects of the growing emphasis on RRI in her work, suggesting that had the potential to foster genuinely interdisciplinary and collaborative research. But she also raised some concern about social scientists being cast in a service or midwifery role (to ‘deliver’ RRI on scientific projects), and asked how we might ensure the independence of social science research when we are becoming increasingly attached to large scientific projects. And she also raised the question of whether how we should balance the ideas of collective responsibility and individual responsibility in future innovation. A lively discussion ensued, raising questions about what might count as an ‘irresponsible’ innovation (with the ownership model of breast cancer genetic diagnostics and financial instruments like asset-backed securities offered as examples); about whether RRI promotes a focus on ‘innovation’ at the expense of other values; about the relationship between innovation and governance; about the risk of RRI turning into a form of stealth advocacy; about whether the concept of RRI is predominantly focused on high-tech, radical innovation as opposed to the incremental innovation; and about the implementation and evaluation of RRI in practical terms. Over morning tea and during lunch, I heard several conversations in the Great Hall that picked up on issues raised in the panel discussion. Some weren’t convinced by the idea of thinking about innovation in terms like ‘responsible’ or ‘irresponsible,’ others wanted to know more about ideas of ‘frugal innovation’ and ‘slow innovation’ that panelists had mentioned (with the suggestion that these might be more ‘responsible’ forms of innovation in some way), and others still were skeptical about how responsible innovation could be translated into practice and evaluated. To my mind, the general skepticism I heard was interesting in at least two respects. First, it suggests that there is need for further discussion and clarification of RRI, and perhaps some experimentation to explore what it might come to mean in practice. But simultaneously, the types of questions and concerns being raised highlighted to me that the term ‘responsible research and innovation’ is already doing something important – it is provoking broader discussion about the role and purpose of innovation, and it is more explicitly putting values on the table as something to be discussed. The ‘people legacy’ session at the EGN Conference came at an interesting time for me personally. 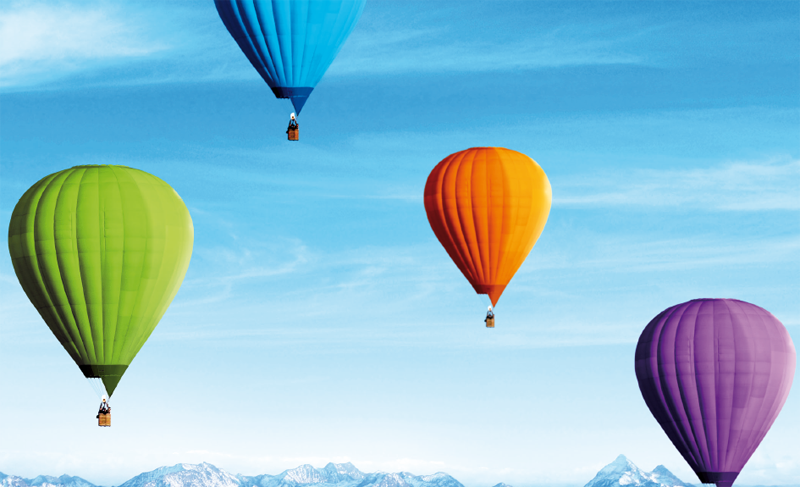 I’m about to be made unemployed, and to go along to a session celebrating the capacity-building function of the network – its ability to launch its graduates and postdocs on successful careers – brings mixed feelings. The rather significant unsaid at this week’s conference is that the end of a major research council investment, such as the Genomics Forum and the ESRC funding for the three EGN centres, brings at least the potential for large-scale unemployment. I can’t speak for the other centres in the Genomics Network. But at the Forum, although the threat of mass unemployment has receded, several staff (myself included) still don’t know where we’ll end up next. That’s not quite true – I know I’ve got a well-deserved and well-planned summer break first of all. But come the autumn, I may or may not have my dream fellowship funded elsewhere at the University of Edinburgh. And if I don’t, who knows? Planning a career break is not something I’ve done lightly, and I certainly wouldn’t change the decision. But there are moments when I do question my faith in my own employability, such as when I talk to other research fellows who’ve interviewed for the same fellowship schemes I’ve applied for, and then been turned down. Am I just demonstrating breathtaking levels of Gen-Y arrogance? Will I find myself locked out of academia for good, REFability or no REFability? At gutter-gazing moments like these, it’s always good to go to a conference session dedicated to the stellar success of former EGN PhD students and fellows. 89 PhD students completed during the lifespan of the EGN – a very considerable achievement, as chair Steve Sturdy pointed out, on top of the core research outputs of the centres. Of these, 4 spoke about their postgraduate and postdoctoral experiences in this session. Heather Walmsley studied at the Lancaster branch of Cesagen and is now Banting Fellow and Postdoctoral Teaching Fellow at the University of British Columbia. Hristina Petkova did a PhD in health economics at Egenis and now works at King’s College London. Farah Huzair studied agricultural biotech innovation at Innogen at the Open University, moved to Canada for a postdoc at Dalhousie, and has now returned to Innogen at the OU. Jonathan Suk, a former Genomics Forum Research Fellow, now works for the European Centre for Disease Prevention and Control. These are sparkling stories and they go some way towards justifying my belief that I should dry-clean my interview suit and polish my shoes, just in case. But there are also stories behind these stories that I’d like to hear. All 4 of the speakers in the session had made significant moves – across the pond, the North Sea, or the country. Were these upheavals wanted? Were they planned? Are even the most successful junior academics subject to circumstance, and the assumption that we can pack our bags and our lives at a moment’s notice and traipse across the world to follow a job? What becomes of friendships, relationships and family ties in these situations? There are certainly rich personal gains to be had out of academic adventure, and I’m not (just) talking about money and professional success. But are there other personal costs? What is gained and what is lost when Dr 20-Something packs up and ships out? These aren’t just gains and losses for the individual, but for the institution that has invested time and money in her or his training. One of the reasons I believe the EGN has been so successful – and we heard much about its success from Paul Boyle, Chief Executive of the ESRC, in his closing remarks later in the day – is the employment security it has offered to junior and senior staff alike. My own 5-year postdoctoral contract is extremely unusual, and my peers across the network have been similarly fortunate. This security has nurtured capacity and careers, allowing enormous scope for creativity in research, knowledge exchange and public engagement. At this uncertain moment, I can only express two hopes. First, I hope that this investment pays off, for me and others in similar positions across the network. Second, I hope the EGN’s ‘people legacy’ reminds the ESRC and other research funders of the value of investing in early-career security and stability. Not all conference panels really work. Quite often, I’m left with the sense that several people talked briefly, even superficially, about disparate topics, and there wasn’t enough time at the end for the chair to draw them together into a coherent discussion! This panel at the EGN Conference was delightfully different, though the topic is serious. Dan Crossley (Food Ethics Council), Ann Bruce (Innogen), Richard Twine (University of Glasgow) and Neil Stephens (Cesagen) each spoke briefly but in detail about some aspect of meat production and consumption – from reducing how much meat we eat, and greenhouse gas emissions from livestock, to the possibilities of veganism, vegetarianism and ‘in vitro meat’. It was an incredibly rich session and it would be impossible to do justice to all four presentations here, so I’m not going to try. Instead, here are some thoughts from me sparked by the presentations from Dan Crossley and Richard Twine in particular. What follows are necessarily my personal thoughts, and not to be attributed to any of the speakers, the Genomics Forum or Network! Having read the abstracts for the session in advance, I went into the lecture theatre willing to feel grumpy – mostly (with apologies to Dan Crossley) because of the Food Ethics Council’s position on ‘less but better’ meat consumption, and valuing the meat ‘we’ eat more. 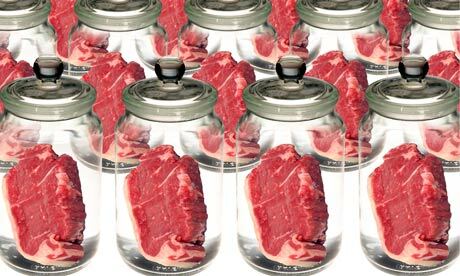 To me, this rather smacks of selling out – if meat consumption is wrong on so many levels (which I think it is), why take a ‘softly, softly’ approach? I’ve written on my personal blog before about the UK Government’s approach to reducing (red) meat consumption, and there are strong parallels here. Since we know that (red) meat consumption has a linear association with certain serious illnesses (rather like cigarettes, there’s no level of consumption that doesn’t increase your risk), why tell people to reduce, when the recommendation should be to cut out? Seemingly, that’s just too much radical change – not just for consumers, but for the meat industry. Insert cynical emoticon here. I can also see the other side. Only 3% of the UK population is vegetarian, let alone vegan. Amongst social science academics, that figure would be a bit higher (though based on last night’s conference dinner, perhaps not as high as I would think). Amongst my friends, the figure is higher still – somewhere approaching 50%. So it’s easy for me to forget that for many people, vegetarianism is still a kooky, socks-and-sandals, why-would-you-do-that kind of activity. And rather like capital punishment in the 19th century, meat consumption may well in practice best be reduced by degrees, not wholesale. Get people used to the idea of meatless meals, increase awareness of industrial farming practices, and meat consumption will gradually go down – or so the theory goes. I can see that over time this strategy will likely lead to overall reductions in meat consumption. And if that’s what you’re aiming at, all well and good. But I can’t actually see that this strategy will lead more people to become vegetarian. Instead, it’s more likely to make people think that eating meat is ok, so long as they do it ‘with care’. And for the life of me I can’t see how the definition of ‘care’ can include slaughtering a healthy, sentient creature without its consent, in order to eat its flesh. So all in all I went into the session willing to feel grumpy, and I came out rather grumpy! The main source of my grumpiness is that animal rights were barely mentioned in a conference session that was all about meat. Indeed, it seems that animal rights aren’t really that relevant to discussions about meat-eating, vegetarianism and veganism anymore. Instead, it’s climate change, environmental sustainability and public health. I was extremely glad when Richard Twine closed by gently encouraging audience members to read more about the relationship between human beings and non-human animals, pointing out that animal ethics tend to get sidestepped in current debates in favour of the ‘easier’ environmental and health issues. Even 10 years ago, this wasn’t the case. Research on vegetarianism in the West consistently showed that animal rights were the motivating factor for the majority of vegetarians, admittedly with personal health a close second. If current environmental concerns can force a major reduction in animal slaughter, I won’t be complaining. But whether they can fundamentally change how the majority of humans conceive their relationship with non-human animals, I’m not so sure.